Ada pertanyaan untuk Tholos Resort Hotel? 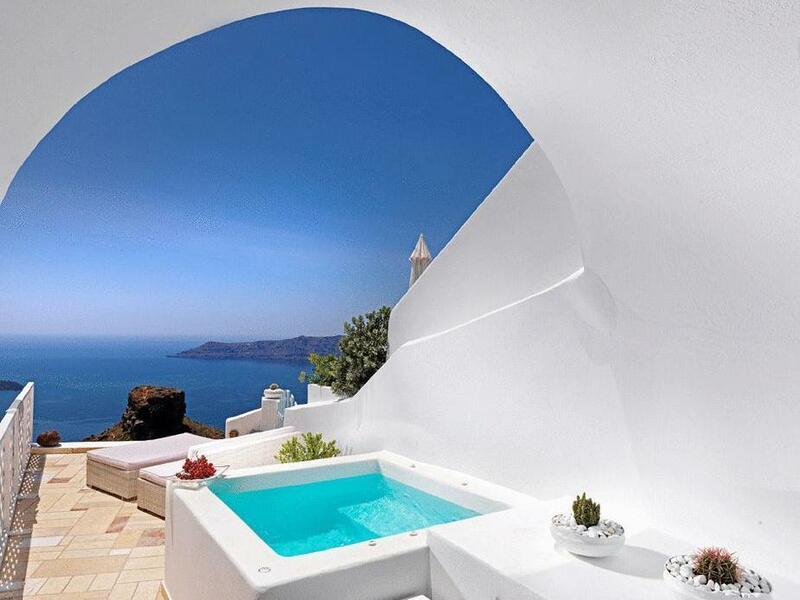 Terletak di Imerovigli yang menyenangkan, Tholos Resort Hotel memiliki posisi yang sangat bagus di pusat melihat-lihat, romansa, pantai di Santorini. Hanya 1.5 Km dari pusat kota, lokasi properti yang strategis ini memastikan para tamu dapat menuju tempat-tempat menarik dengan cepat dan mudah. Imerovigli, Aegean Designs, Megaron Gyzi Museum dapat dicapai dengan mudah. Di Tholos Resort Hotel, pelayanan istimewa dan fasilitasnya yang unggul akan membuat pengalaman menginap Anda tidak terlupakan. Untuk kenyamanan para tamu, properti ini menawarkan WiFi gratis di semua kamar, penyimpanan barang, Wi-fi di tempat umum, tempat parkir mobil, layanan kamar. Properti ini memiliki 12 kamar yang didesain dengan cantik. Banyak kamarnya dilengkapi dengan televisi layar datar, toilet tambahan, akses internet - WiFi, kolam pribadi, akses internet WiFi (gratis). Sepanjang hari Anda dapat menikmati suasana menenangkan dari persewaan perlengkapan olahraga air, hot tub, kolam renang luar ruangan, pijat. Fasilitas super dan lokasi yang istimewa menjadikan Tholos Resort Hotel tempat yang sempurna untuk menginap di Santorini. Anak berusia 0 hingga 6 tahun dapat menginap gratis menggunakan ranjang yang telah tersedia. Anak berusia 6 hingga 12 tahun akan dikenakan biaya 50% dari tarif untuk dewasa. Anak berusia 12 tahun dan lebih dianggap sebagai tamu dewasa. First, let me say that the hotel is nice, with a great view of the caldera from the pool and restaurant. The only thing is that, as other properties in Imerovigli, you need to go up and down irregular seps for many floors to go to the room or to different areas of the hotel. We counted like 8 floors to go and have breakfast. But the view makes it worth it. I got a room which I never saw in any of the pictures of the hotel. It looked like a cave. The window was in he entrance hall but the bed was set further in a tiny round space with no direct openings. The round space around the squared bed created irregular gaps were everything fell, including the pillows. The night lights were placed in a way you could hit them whit your head. Around the bed there was a sink, a door to the wc, a space for clothes without shelves and an open shower. It was very basic. In the showered there was no place to hang towels, or put shampoo and soap, other than the floor. Our "private balcony" was used as a pass-way for the cleaning staff, since it was shorter for them thang going around it. I asked if they had another room, since this was not what I expected, and they said that they had a nicer one for €200 per night additionally to what I had paid. Wifi didn't work for the first two days, and the front desk girl didnt seem like she cared. Instead of offering to check it, she insisted that no one complained before about it. It's a nice place, but service in the front desk could be better, and many details in the room could be fixed. Great Location for Sunset View. Breakfast at your own balcony. Tasty breakfast. 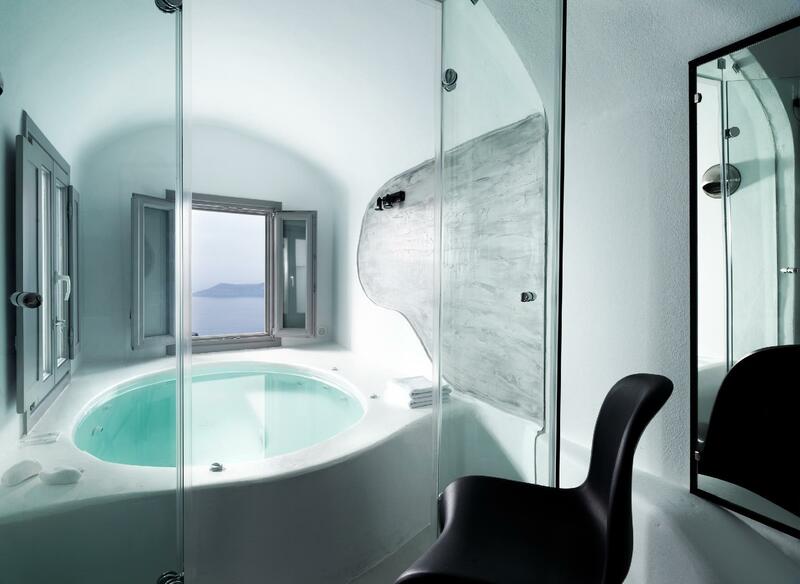 I stayed in 3 hotels during my stay in Santorini. And Tholos Resort is by far the best among these three. Pro: 1. You ordered the breakfast the night before. And it would be served to you at your balcony next morning. Having the tasty breakfast at your balcony with the great view of the caldera! 2. Room is spacious. The washroom is also spacious. I like the room very much. Cons: 1. Pay the money and use the hotel's airport/ferry port transfer service. 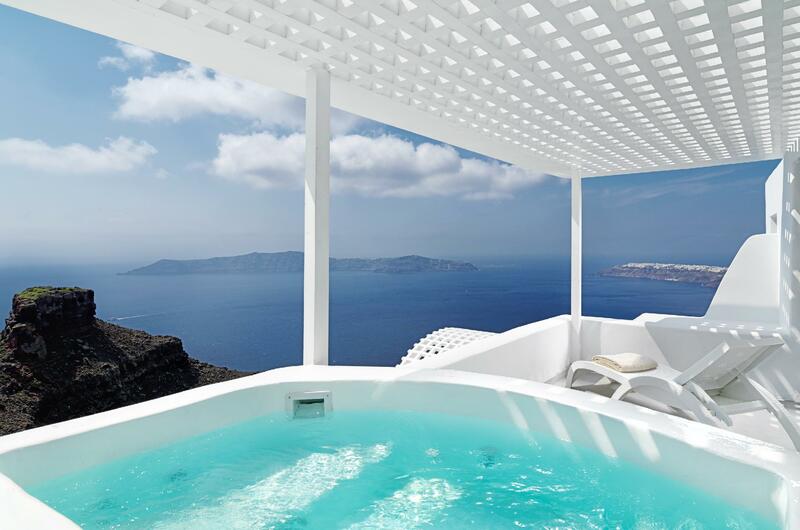 It is VERY difficult to locate the hotel if it is your first time in Santorini. we booked a family suit.Room was good decoration but room condition is not so good. Excelent view,nice staff.Near good restaurant. Rooms are clean & pleasant. The staffs are friendly . The view is fantastic. I loved the hotel & the view of the sea. It's so beautiful and you are able to see the sunset from your room with out going to Oia. . The staff of this hotel ( Michella ) is so friendly and was willing to help in making sure all our request was met. I would defiantly recommend this hotel to friends. However, do come prepare to climb the chairs. But the beauty of the scenery Is worth the effort. Excellent Location, Best view of Sunset, Excellent food and Superb Service. We thoroughly enjoyed our stay there. Thanks Maria and other staff. We loved our stay at Tholos. The honeymoon suite was beautiful. Loved the cave rooms and especially the wonderful staff and breathtaking views from our room and all of the hotel. Lots of steps but worth it.